Leafy vegetables are tasty, healthy and full of nourishing vitamins. One of the best ways to enjoy this nourishing goodness is in form of this tasty soup known as Edikang Ikong. Edikang Ikong is a tasty vegetable soup Native to the people from the south-south part of Nigeria. It's basically made with two vegetables; Waterleaf and Ugwu leaf . Now, the preparation of this soup is more like a work of art in the sense that this is not your average vegetable soup and if you skip the basic important steps, you'd end up getting a totally different result. To get the perfect edikaikong soup, using the right quantity of vegetables is key. 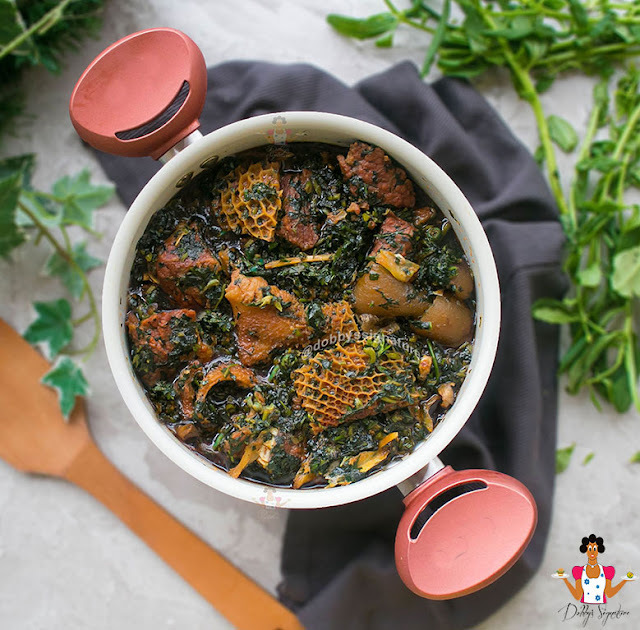 Also, the end result of the soup preparation is mostly is made up of mostly leaves mixed with oil than water, meaning the only liquid that should be in the soup once prepared is palmoil and the waterleaf juice. A tasty leafy vegetable soup made with pumpkin leaf and water leaf. Perfect when served with your favorite swallow. Step 1: The first step is to chop the leafy vegetables. Now you have to chop the vegetables really really tiny. Once you do that, set aside. Step 2: Soak the stock fish in hot water. This helps soften it. Set this aside. Step 3: In an empty pot, add the beef, pomo,shaki, pepper (blended), crushed seasoning, salt to taste. Add a little water and cook for about 25 minutes till it softens. Add the stock fish and keep cooking till the whole liquid in the pot dries up leaving the concentrated meat and fish stock. Step 4: Pour in the palmoil. This would mix with the concentrated meat and fish juice. Now, add the periwinkles, crayfish and water leaf into the pot. Leave to cook for about 3-5 minutes. During this period, the water leaf would bring out water. Step 5: Now its time to add the chopped ugwu leaves into the pot. 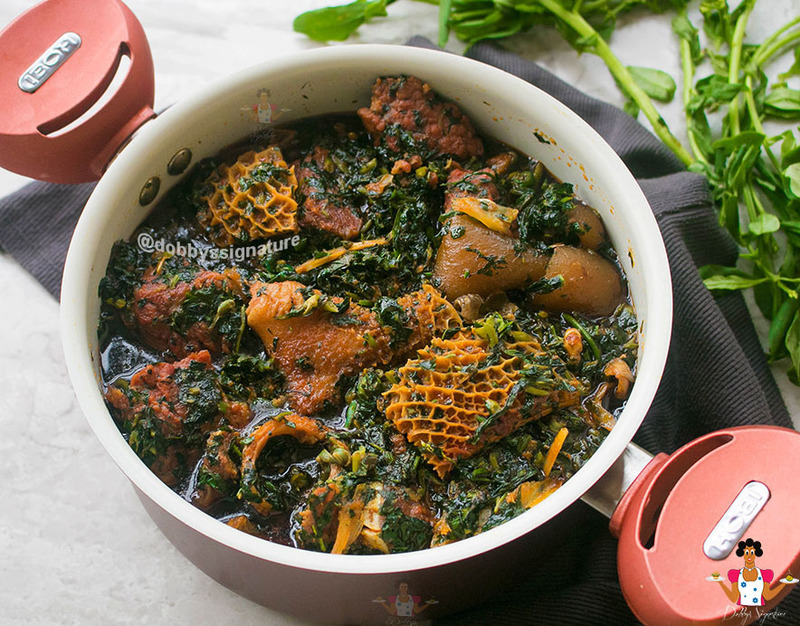 The more ugwu leaves you add, the thicker and less fluid your soup would get. And this is what you want to achieve as your final result. Step 6: Leave to simmer for about 10 minutes before turning off the burner. And your Edikaikong Soup is ready. Serve with any form of swallow.